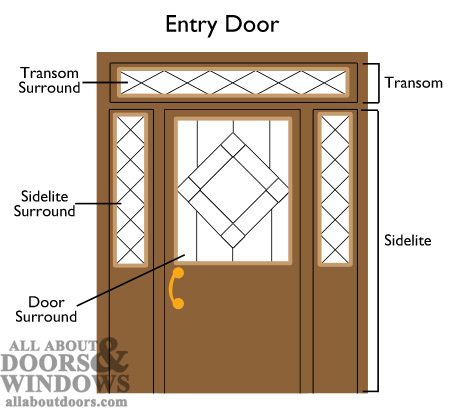 This article will guide you in replacing surrounds in entry door sidelites, transoms or active door panels. This guide applies to universal standard surrounds manufactured by many companies, including Therma-Tru, ODL, Masonite and Stanley. "Surround" refers to the glass unit consisting of the pane of glass, exterior moulding and interior moulding. All About Doors & Windows is proud to carry surrounds; surrounds are typically only sold locally due to high cost of shipping. 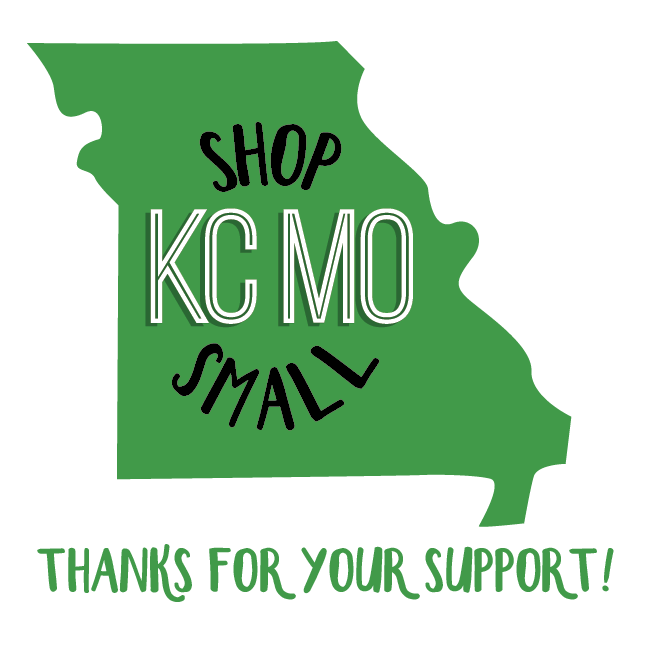 Contact us through our website if you have questions or need help ordering. **NOTE 1: Use caution when drilling near and handling glass. Wear protective eyegear and gloves. If glass in surround is broken, remove all loose shards with gloves or pliers before removing surround from door. NOTE 2: For the purposes of this article, we removed a surround from a door sidelite. The process is the same for removing surrounds in transoms and active door panels. 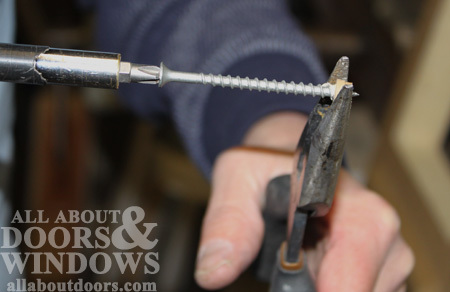 Remove plugs from all screwholes on interior side of sidelite by drilling a threaded screw into each plug; screw will go through plug and pull out easily. Remove plug from screw; use pliers to grip plug while unscrewing screw with drill. On exterior side of sidelite, apply duct tape along edge where panel meets sidelite. 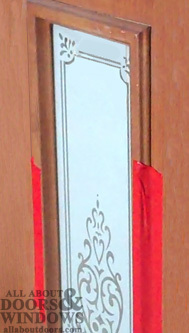 Door sidelites install through exterior; not applying tape could cause the surround to fall out of the panel and break. 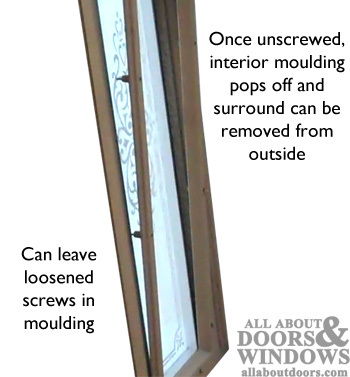 Loosen all screws on interior side of sidelite and remove moulding. From outside, remove tape and remove surround. 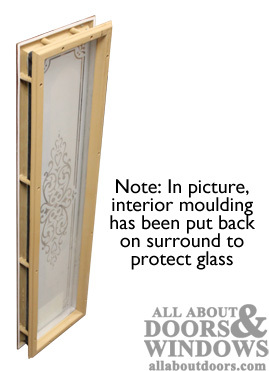 If not immediately reinstalling surround or in case of transporting surround, reattach interior moulding to protect glass. *Note: Surround should easily pop out, although may need some pushing from interior side. If only replacing lite frame (moulding), take moulding off of glass block. Replace with new lite frame. Make sure new frame is designed for same thickness of glass. *Note: Plugs removed in step 1 are not reusable.